"I don't know but I wanted to thank him." On New Years Day, 1908, Harry Bensley (1876-1956), a well-to-do lone ranger involved in a £21,000 wager that he could walk around the world in an iron mask and marry without revealing his identity, embarked on his journey, a trek that began at home in Great Britain and supposedly took him through China and Persia before the outbreak of WWI brought his global schlep to a screeching halt in Genoa, Italy. The terms of the wager - purportedly made between J.P. Morgan and Lord Lonsdale with Harry the volunteer test subject - stipulated that Bensley begin his journey with a single pound note and a change of underwear through 169 British cities and towns in a specific order; he would have to collect a signature from a local prominent resident to prove that he had been there. After that he would begin a tour of eighteen countries in a pre-specified order. 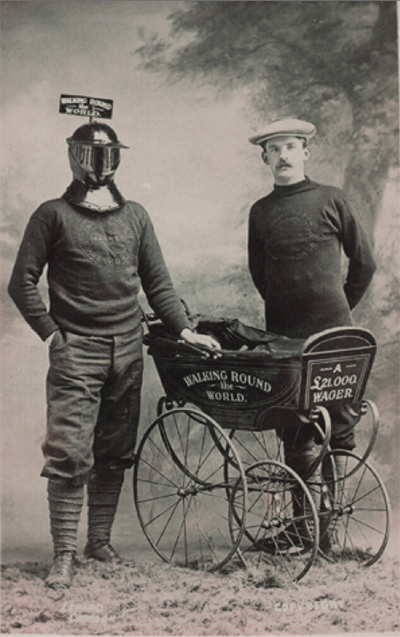 He was to support himself along the way by selling postcards such as this one, which portrays him in his knight's helmet with printed sign in lieu of plume, sweater embroidered on the rear with the legend, "Walking Round the World Masked," a custom pram which should have been called "The Orient Non-Express" but wasn't, and paid attendant in matching sweater whose name is unknown but whom we shall call Tonto to our masked Kimosabe. Some people, of skeptical turn of mind, claimed that Bensley never left England. Oh, cruel nattering by nincompoops of little faith! But here's the proof that Bensley, in full metal masquerade from the neck up, and with pram and attendant present, perambulated to a photography studio for a series of promotional mug shots. Whether he ever actually left the studio and crossed the English Channel to promenade through Europe and Asia is another story. One can't help but wonder if he wound up in the Bastille, courtesy of the King of France, for claiming to be the King's twin brother, his personal attendant, The One Musketeer, in the cell next door. Bensley didn't but his investments in Russia were wiped-out during the Bolshevik Revolution, he was left destitute, and worked low-paying unskilled jobs until his death. Oh, ladies of too much faith! Harry supposedly received over 200 marriage proposals during his voyage from damsels who had never laid eyes upon his visage and didn't care. His wife, whom he married c. 1898, ten years before the wager, was, presumably, not amused. But, then again, maybe she was. She knew what he looked like behind the wrought iron veil.